Our transparent “cost-per-lead” pricing, coupled with an audience targeted specifically for your organization, bring you an unbeatable ROI. You tell us how many amazing people you want us to recruit. We deliver that amount, guaranteed to be new to your community, in the time frame you determine. And that’s it. That's all you pay for. And that’s what you’ll get with Care2. Depart from the traditional (and risky) way that online ads are sold, which is on a cost-per-thousand-impressions (CPM) basis, and carries no guaranteed measurable results or successful performance. CPL pricing is just a better way of doing business. 100,000 email subscribers in just over two months. Oceana's work to protect and restore the world's oceans is made easier because of Care2's ability to raise awareness to a large international audience and generate new activists for our network. We have always been impressed with Care2's ability to recruit tens of thousands of new high-quality Oceana activists in a short period of time." You book your planning session and send us some background information about your organization and goals. We schedule a mutually convenient time for a call. We get on a call together and give you specific feedback on your strategy and budget. We then start the planning process, which covers cash flow planning and ROI scenarios. It all sounds good, but really, how much does this cost? Generally, the cost per new supporter ranges from $1.50-$2.00. But it depends on the targeting criteria used. From what we've seen, the typical lifetime value of an email address is between $10 and $20, which is quite a high ROI. 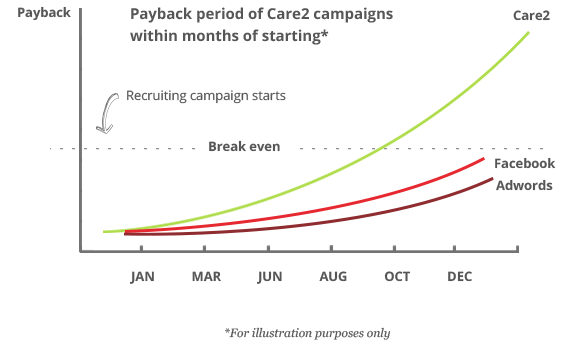 We’ve seen a positive ROI in as little as 6 months, but it can take up to 24 months. It all depends on how you fundraise and how many fundraising channels you use. What type of organizations is this for? Non-profit organizations and socially conscious brands that want to grow their audience with passionate, highly engaged supporters.